We're one step closer today to deciding the ultimate cuppa with the announcement of the 12 contenders which will go mug-to-mug in the pursuit of tea perfection. Our crack team of shopping experts has braved multiple supermarkets in search of your nominations, and we're set to turn the matter over to our panel of tasting experts. Before revealing the delicious dozen, we should recap for those who haven't been following our entertaining ultimate cuppa saga. Back in February, we asked our beloved readers to share their own preferences, and so great was the response that it quickly became evident we'd have to narrow down the number of teas for testing and establish a standard brewing methodology. While fans of exotic first flush leaves, plucked with golden tweezers from atop dew-kissed tea bushes carpeting misty Himalayan valleys by maidens in ethnic costume and gently crooning traditional folksong to the sound of a roving panche baja ensemble, protested the results vociferously, it's important to note that "the aim of our investigation is not to examine the hundreds of possible tea type/brewing permutations, but rather establish a set of basic rules which can guide the uninitiated towards chai nirvana". So, with that sorted, we moved on to deciding which teas would make the final cut. 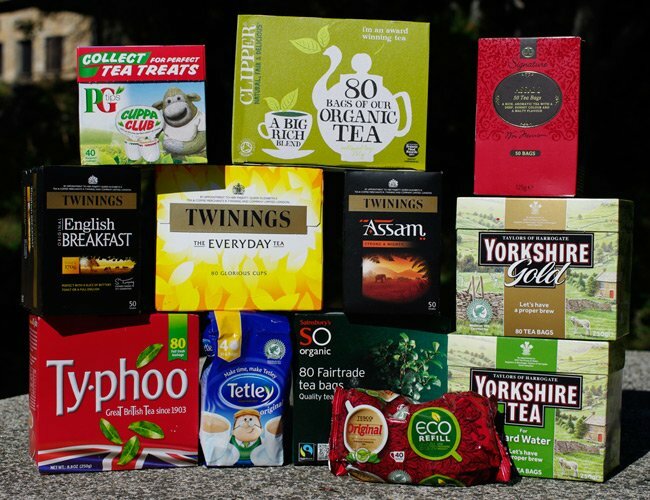 Once you'd responded to our invitation for nominations for readily available teabags, we compiled a list of the most popular and hit the supermarket shelves with the awesome power of the Special Projects Bureau's beverages budget. Before you all kick off, as we're sure you will, we'd like to say there's one significant omission here: Nambarrie, as trumpeted by several fans. Having suffered the trauma of three supermarkets in quick succession - none of which stocked this blend - we deemed it not "readily available". Ditto Irish fave Barry's Tea, which makes a fine brew to be sure, but is limited largely to the Emerald Isle and online outlets. And no, the availability of a tea on the interwebs doesn't make it readily available, for the purposes of this test. *Yup, we've got hard water round these parts. We're interested in the difference between this and the standard Yorkshire tea, so we'll throw Bettys & Taylors of Harrogate Limited an email to get some technical info on the blending and let you know.